Follow along as Ron guides you step by step in this easy draw and paint dinosaur video of a ‘Charming Bronto’ called Thunderfoot. Let’s get stared with the Artabet Welcome and the Artabet Energy Line Warm Ups. Materials / pencil and regular 20lb bond paper. Erasers help us draw. Keep this in mind as you pass out the pencils to your students and they get ready to an easy drawing of a dinosaur. You will see in the video how we approach ‘eraseritis’ and accept that what we draw is good and fine and has no ‘mistakes’ in it. Materials / black sharpie, 1 small piece of 140 lb. or 90 lb. watercolour paper, 10 inch by 12 inch drawing board ( you can use your desk ) a roll of green painter’s tape. I purchased a few inexpensive sheets of what is called ‘door skin’ at the local Lumberyard and had them cut into 10″ by 12″ boards. They are light and safe for the Kids to work with as ‘mini’ drawing boards. You made it to the ‘Paint Party’, here is what you will need for each student. Paints can be shared if you make pods of 4 desks. Number 6 or 9 synthetic round brush for each student. Their sharpie drawing of Thunderfoot. Water for cleaning brush in between each colour change. Paper towel or small rag for ‘Touching Tip” of brush before applying paint to the paper. Wasn’t this an Easy Draw and Paint Dinosaur. My students have enjoyed Thunderfoot every time we draw dinosaurs. Sometimes Thunderfoot is a He and sometimes a She. Sometimes there are hearts all over Thunderfoot and then It’s “Heartasore” looking for the “Happiness Tree Leaf”. Other times we saddle up Thunderfoot and set off on an adventure into a magical landscape. In every case we ‘Draw a Story’. There are ‘NO RULES IN ART’ only ‘PRINCIPLES’ !!! 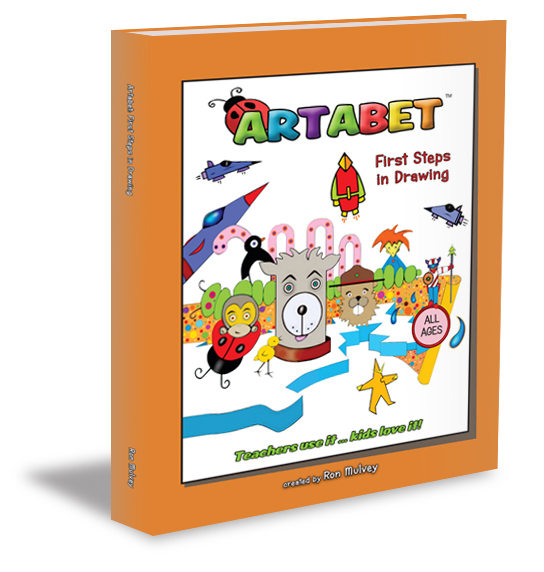 Our book the “Artabet First Steps in Drawing” outlines these principals of drawing, and shows you how to use them to make Drawing a Story easy and fun. Here is what Mrs. ‘M’ has to say about using the Artabet in her Classroom.